For Miles Himmel ’10, following in his father’s footsteps is not just a goal but a lifetime mission. As co-founder of the Larry Himmel Neighborhood Foundation, Miles hopes to continue his father’s legacy by paying it forward. “Don’t ever underestimate the power of a rose or the joy of a random act of kindness.” Those were Larry Himmel’s concluding words on a special news segment on CBS News 8 on Valentine’s Day 2014, just a few months before his passing. Himmel spent that day greeting strangers and handing out roses on the streets of San Diego. Fast-forward four years, and Himmel’s son, Miles, has picked up right where his dad left off with the founding of the Larry Himmel Neighborhood Foundation, roses in hand. Larry Himmel was a San Diego icon, a legendary reporter, a man of humor and a friend to all. But to Miles, he was Dad. While San Diegans remember Larry, the reporter and entertainer, Miles remembers his number-one fan, faithfully cheering from the sidelines at La Jolla Country Day School sporting events and play productions. Everything changed when Himmel was suddenly diagnosed with pancreatic cancer and passed away a few months later, in November 2014, leaving a hole in the collective heart and soul of San Diego. Miles reflects on that difficult period with a sadness that reveals the unique bond between father and son. “He was 68 at the time, still working,” he shares. “[He] literally worked until a month before he passed away. He had lost 30 pounds, his pants didn’t fit him, but he kept wanting to work because he enjoyed it so much.” But even through the painful memories of his dad’s final weeks, Miles remembers the moments of joy and random acts of kindness that his dad created for others. He describes one memorable occasion in 2013, when Himmel transformed an ordinary Wednesday into an unforgettable “hump day” with the surprise appearance of an unexpected guest: a camel from Ramona’s Oasis Camel Dairy. Barely squeezing through the front door, the camel took a tour of the building, greeting staff from the halls of Channel 8’s newsroom, later renamed the Larry Himmel Memorial Newsroom. From joyful memories like these, the Larry Himmel Neighborhood Foundation was born. After his dad’s passing, Miles and his boss from KFMB-TV brainstormed ways to celebrate Larry’s legacy and honor his commitment to the San Diego community. In February 2015, they founded the Larry Himmel Neighborhood Foundation. Three years later, the foundation has flourished with Miles spearheading the way. To accurately reflect the work they planned to pursue, Miles and the board of directors adopted a mission for the foundation stemming from Larry’s personal motto: “To make people feel better about the place they call home.” In that spirit, the foundation created the Good Neighbor Award, recognizing individuals who have dedicated their lives to the greater good of San Diego. The foundation presented the inaugural Good Neighbor Award to Barbara “Sister Pee Wee” Harris, founder and owner of Pee Wee’s Soul Food Kitchen, a favorite gathering spot of Larry and Southeast San Diego residents for over five decades. Due to health issues, Sister Pee Wee closed its doors in October 2017 after 63 years of business. Following the restaurant’s closing, community members gathered to celebrate Sister Pee Wee’s generous spirit with the presentation of the foundation’s Good Neighbor Award and the proclamation of Sister Pee Wee Day by Councilman David Alvarez. The Larry Himmel Neighborhood Foundation responds to a variety of local needs, from literacy to haircuts and everything in between. One of Miles’s favorite projects is a collaboration between the foundation and the Riley School, a special education school that offers children intensive social and emotional support. In 2017, the foundation adopted the school and donated two 55-by-9-foot hand-painted murals to adorn the exterior walls of two classrooms. The aquatic scene evokes a larger-than-life aquarium to welcome Riley students, faculty and staff, and usher in an exciting new partnership. Miles hopes that the school’s new look will foster a greater sense of school spirit and community for all to enjoy. Another notable partnership led to the creation of the foundation’s most popular event, the annual Back-to-School Haircut Drive. The drive takes place before school starts in late August, inviting more than 300 San Diego students to the California Barber & Beauty College to get a fresh new do to start off the school year. In partnership with local organizations, students in attendance also receive school supplies and free tickets to local attractions. Miles has also followed in his father’s footsteps behind the microphone. 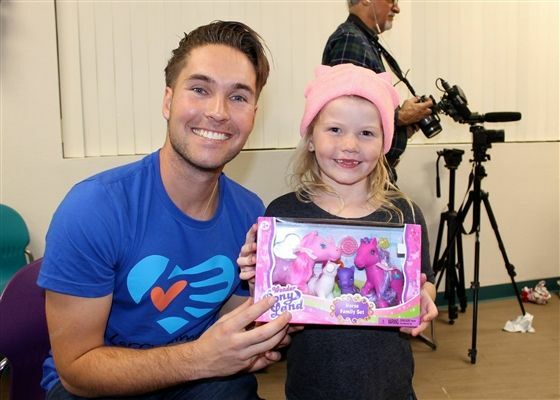 With a bachelor’s degree in communications from Bradley College in Illinois, he now serves as the producer of KFMB radio station in San Diego, a play-by-play announcer for Tritons TV at the University of California, San Diego, and a freelance videographer. When asked about the overall objective of his foundation, Miles dons an infectious smile and circles back to his dad. “I would love for a kid or someone who never knew my dad to get to know him through our foundation. That’s been a goal of mine.” It is that goal that drives Miles and his foundation to continue his father’s legacy, to turn sadness into joy and to make San Diegans feel great about the place they call home.